The black Currant plant (Ribes nigrum) is a deciduous shrub with toothed and pointed leaves. Flowers form in loose pendulous racemes in the same axis as the leaves and are greenish-white in colour (figure 1). The black Currant plant is native to Asia and Europe but is now found throughout the World where it is widely cultivated for its berries. 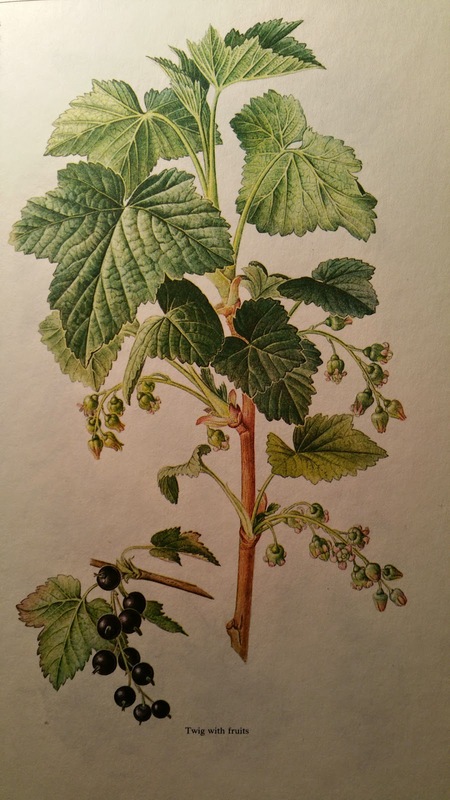 In Britain, the black currant shrub can be found growing wild in hedgerows and woods, and the berries from such plants are frequently harvested for their nutritional properties. In this regard, traditionally, black currants have been used to create jams and preserves. However, the black currant shrub is far less common in the British Isles than other berry producing shrubs such as the blackberry plant (Rubus Sp.). Historic records show that the medicinal properties of the black currant plant date back to at least the 16 century, but the plant is now largely grown for use in the food industry for its colour and flavour enhancing properties. Figure 1. The black currant plant. Picture taken from: Stodola, J., Volak, J. and Severa, F. 1984. Illustrated Book of Medicinal Herbs. Octopus Books, London. First edition. Black currant berries are a rich source of vitamin C and also contain polyphenols. The polyphenolic fraction of black currant berries is made up mainly (~75 %) anthocyanins from the flavonoid group of polyphenols. However in addition, black currant berries also contain other flavonoids, most notably flavonols including quercetin. Hydroxycinnamic acids and their derivatives such as chlorogenic acid also make up a substantial amount of the polyphenols in black currant berries. The polyphenols in black currant berries have been shown to inhibit the intestinal enzyme α-glucosidase, and in this way may have beneficial effects of blood sugar. The berries also contain pectin, a soluble form of fibre that may further stabilise blood sugar levels. The leaves of black currant shrubs are rich in vitamin C, organic acids, tannins and essential oils and have been studies for their diuretic and diaphoretic properties. Decoctions of the leaves are thought useful in the treatment of diarrhea, rheumatism and urinary infections.